The courts are an important factor in keeping fabric of society intact. Judges exercise considerable power in the judicial processes of the country and are held in high esteem in the public’s eye. However, since their role demands a lot of responsibility complex decision making, there are a number of academic and professional stages that you will have to go through in order to increase your prospects of becoming a judge. What are the roles and responsibilities of a judge? As a judge, you may use different forms of technology, such as electronic databases and software, to manage cases and to prepare for trials. You will listen to arguments and determine whether the evidence presented deserves a trial. In criminal cases, you may decide that people charged with crimes should be held in jail until the trial, or set conditions for their release. Besides, you will have the authority to approve search and arrest warrants. Before you pursue this line of work, you must know that it’s not as easy as it sounds. You must know that any example of poor personal judgment going forward will quite likely be discovered and discussed in the press and within communities. Some judges are appointed or elected into judge positions while others are appointed to serve on contract basis. Judicial nominating commissions screen applicants for judgeships in a number of states and for some federal positions as well. Before you may be elected or appointed as a judge, you must learn the necessary skills through years of experience as practicing lawyers. Though few states allow those who are not lawyers to hold limited-jurisdiction judgeships; opportunities are better for those who have experience as lawyers. Judges must go through training before they are elected or appointed to serve as a judge. Judicial education and training for judges is offered by The Federal Judicial Center, American Bar Association, and the National Center for State Courts. In these programs, you will get a chance to participate in court trials, review legal publications and complete exercises. Once you go through these trainings successfully, you will be ready to serve as a judge. As most Judges are lawyers before they get to this position, they already hold a license to practice law. Decision-Making Skills. Judges must be able to evaluate the facts, and make the right decisions. Critical-Thinking Skills. Critical thinking skills are also essential for judges as they are required to apply rules of law. Listening Skills. Judges must pay close attention to what is being said so that they may evaluate information in an effective manner. Reading and Writing Skills. Reading skills are critical to this line of work since judges need to evaluate and distinguish important facts from large amounts of sometimes complex information. Besides, aspiring judges should have strong writing skills so that they may make the right recommendations and decisions on appeals and disputes in a clear and effective way. Judges should also be able to manage stress as this work can be quite challenging at times. The most difficult challenge is the public life that you may lead. What are the Job Prospects for Judges? According to the Bureau of Labor Statistics (BLS), there were about 43,200 judges in 2012, all employed by federal, state, and local government. Most job openings are due to judges leaving the occupation as a result of retirement. Though competition is strong, you if have the right skill set and experience, you may be able to qualify for this occupation. As a judge you will have to mostly work in offices and courtrooms. Sometimes you may have to travel to different counties and courthouses. You may have to sit for long periods which can be physically demanding at times. What are the Wages and Benefits? Many people avoid court trials as they can be costly and opt for arbitrators, mediators, or conciliators. These professionals play a role to some extent similar to judges and reach decisions that may be binding, requiring applicants to hold up their end of the bargain. Becoming a judge is an opportunity to serve the community, a chance to deliver justice. Though, this is very selective position, but for those with the education, drive, experience and commitment, becoming a judge offers a respectable position with suitable pay and perks. How to become a judge in Texas? The process of becoming a judge in Texas varies according to the level you intend to apply for. You can become a judge in Justice Courts, Municipal Courts, County-Level Courts, District Courts, Court of Appeals, Court of Criminal Appeals and the Supreme Court. For instance, if you are looking to become a judge at a County-Level court, such as the Statutory County Courts in Texas, you will need to fulfill certain requirements. These include being a US citizen of at least 25 years of age and being a resident of the said county for at least two years. In addition to that, you will need to be a licensed attorney who has practiced law or has served as a judge for at least four years. Selection is done through county-wide partisan elections and vacancies in-between elections are filled by county commissioners. How to become a judge in California? To become a judge in California, you will first need to attend an undergraduate school. Though no major is specified at this stage, law students are encouraged to take courses in history, business, political science and economics. Following this, you will need to earn a law degree called the Juris Doctor (J.D.) Degree, which requires three years to complete. Once you get your JD degree, you will need to pass the California Bar Exam through the State Bar of California and begin working as an attorney. You will need at least 10 years of experience working as an attorney to qualify for the position of a judge at the Superior Court level. The appointment of judges is done through elections. 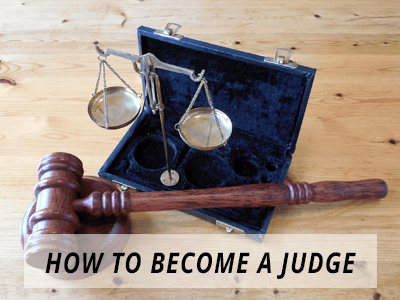 What are the requirements to become a judge? Q:Is becoming a judge easy or hard? How much work experience do I need? A:Is becoming a judge easy or hard? How much work experience do I need? ANS- Whether a career is easy or hard will depend upon your willingness to work hard and provide input. Judges are usually appointed by a committee. Therefore, individuals must prove their reliability and potential by gaining plenty of work experience as a lawyer. You can choose to specialize in various law fields such as corporate law, family law, and more. Q:What are the educational requirements to become a judge? Q:How long does it take to become a judge? Q:What are the requirements to become a judge?